You want to escape from your hectic schedule, if only for a weekend? 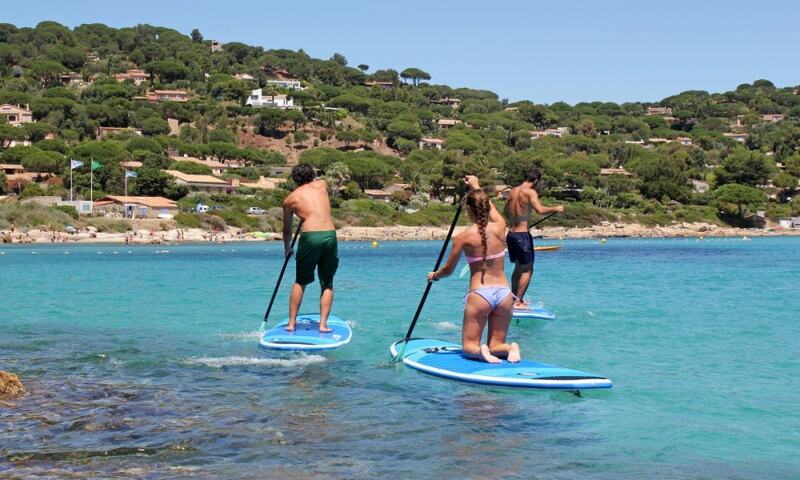 Discover outdoor activities, take in some sightseeing or relax and do nothing but enjoy the spirit of Provence. An exceptional location between the sea and the sun! 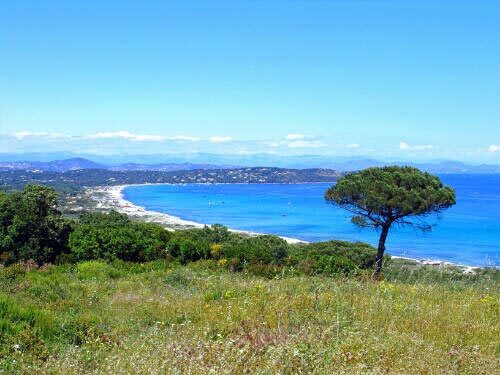 Havens of peace – right by the sea – where beach establishments welcome you to a legendary destination on one of the most beautiful beaches in the south of France. Located at the southernmost end of Pampelonne Beach, just after La Pointe where Eddy Barclay had his house, the Bonne Terrasse inlet once sheltered fishermen’s traditional pointu boats. Today its 150m long sandy beach is bordered by houses and you can still find Chez Camille, the restaurant so famous for its bouillabaisse. 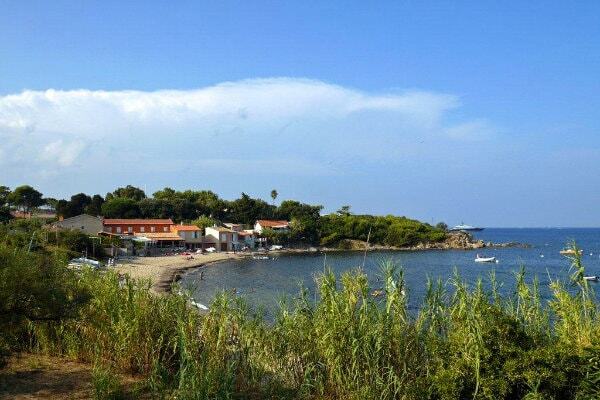 Between Cap Camarat and Cap Taillat, this family beach is around 350m in length. Mask and snorkel are a must if you wish to explore the underwater world. Unless of course you prefer to rent a kayak or paddleboard ! 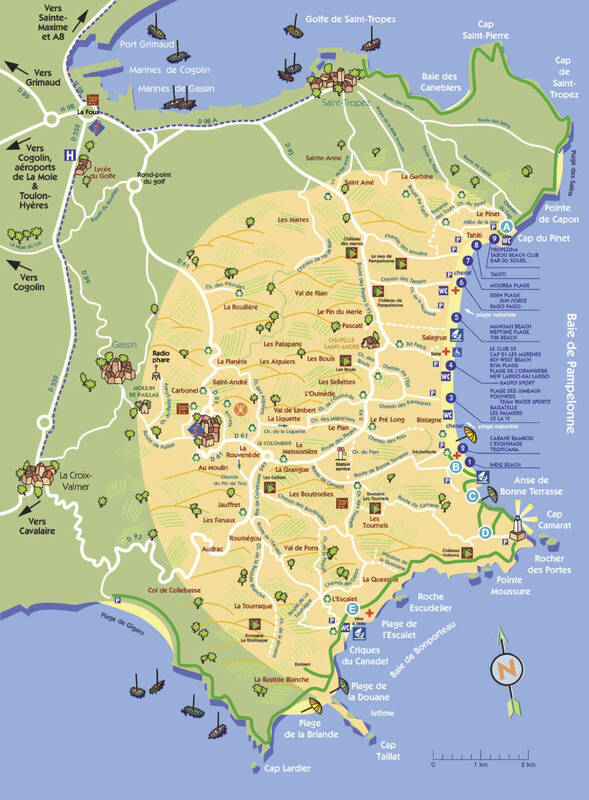 There are nine access points to the Pampelonne public beach. 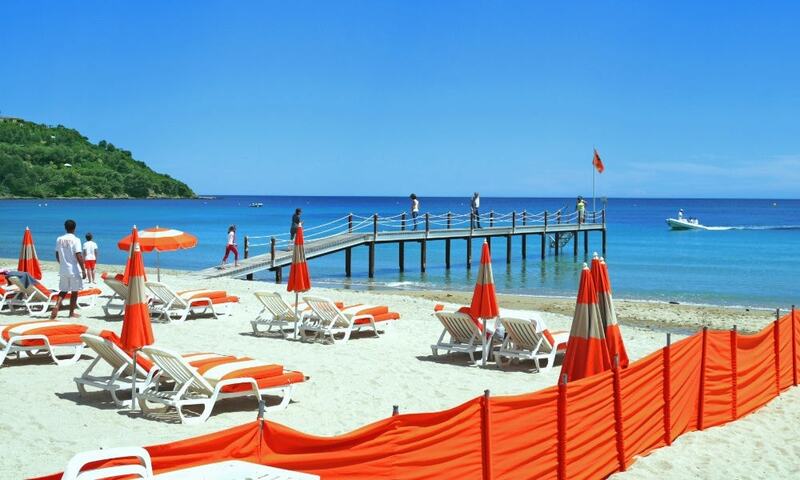 Here you will find restaurants and bars offering the full service from renting sun loungers and umbrellas to tasty meals and refreshments. 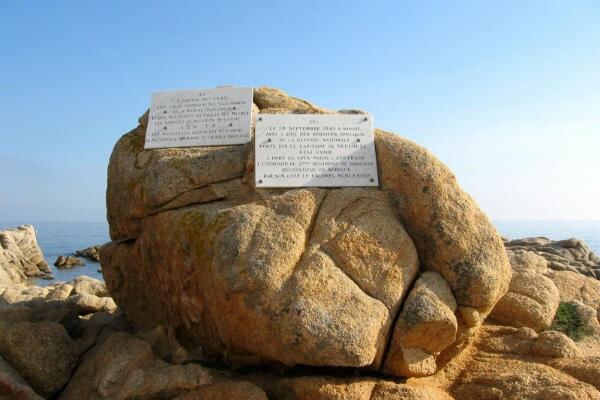 To go there, from the Escalet beach, take the littoral path (on the right to the Cape Taillat). 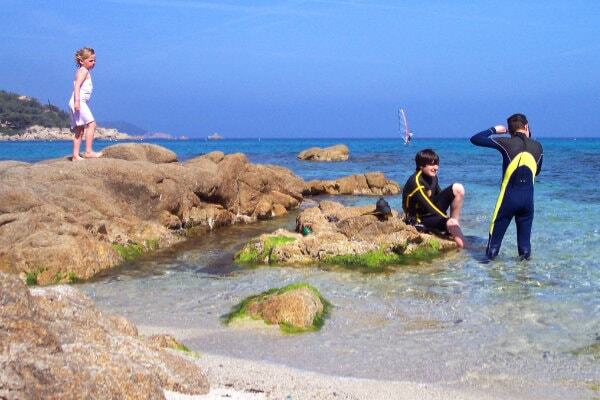 After 700 meters, you will discover a succession of small coves and beautiful inlets with in background the Cape Taillat. Don’t hesitate to go there early in the morning to benefit a sandy cove only for you! Signposted from the port of St Tropez along to La Croix Valmer (Gigaro beach). You can walk right along the edge of the sea, past the different bathing establishments, both public and private, which succeed each other along the most extensive beach on the peninsula : Pampelonne (scene of the Allied landings on 15th August 1944). Municipal car-park on the Route de Bonne Terrasse, after the holiday village of Léo Lagrange. 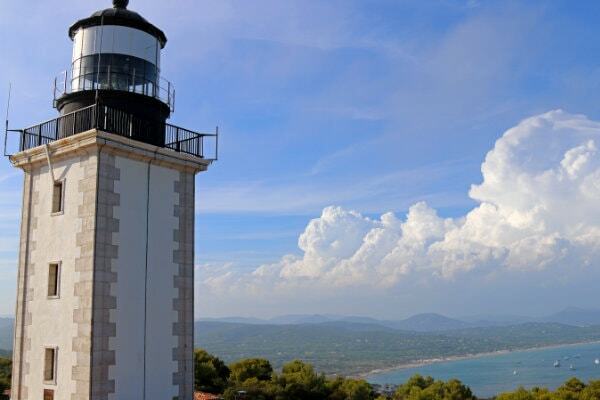 At the far south of Pampelonne, take the footpath along the base of the rocky coastline. After about 100m , don’t miss the well of ‘Lou Pous’ with its resurgence of fresh water, before arriving at the beach of Bonne Terrasse and its fishermens’ cottages. Possibility of returning via the footpath after the restaurant ‘Chez Camille’, or of going further along on ‘Circuit C’ to Cap Camarat. idem circuit B et As Circuit B + extra parking (15 places) along the road to the restaurant Chez Camille’. which you will reach after about 500m. The steep road on the left over the sea, leads up to the ‘Rocher des Portes’ or ‘Bird Island’ (30mn – ). Possibility of climbing up to the Lighthouse (15mins up a path on the right).The Lighthouse dates from 1831, and was the second most important in France for its height and luminosity : 130m above sealevel. Can not be visited. This itinerary starts with a succession of ups and downs along the rockface, before coming to sea-level along to Escalet Beach and its little private harbour. Discover the outcrop of the Napoleonic Battery, the village of Merlier (35 houses built in the 1960’s by the achitects known as MONTROUGE, combining traditional and modern features) ; the Château Volterra (a private residence from the 1900’s) and the Escudier Rock (commemorating the submarine missions and escape of the banner of the 2nd regiment of Dragons during the Second World War). next to the tennis courts. 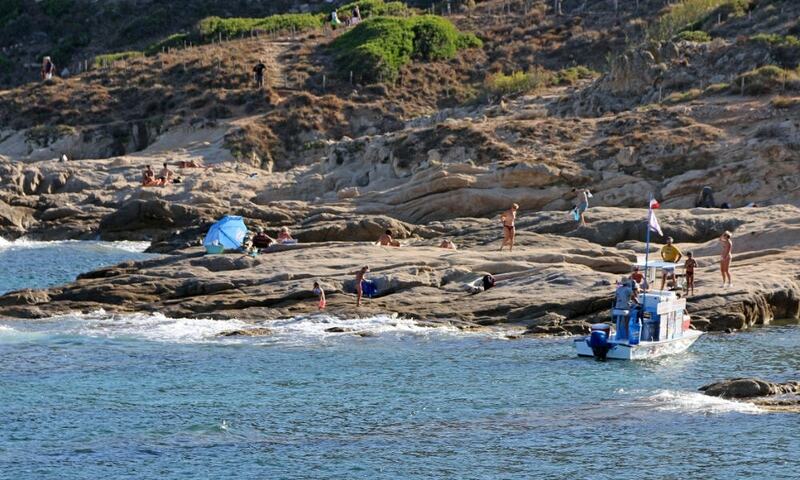 Go down to the beach and take the path which goes down some steps to the right, (after the villa). Direct access to the footpath. Undoubtedly the most beautiful stretch of the coastal walkway, with its backdrop of the isthmus of Taillat, which can be reached after a succession of rocky inlets. change with every breath of wind. Behind the Customs’ House on the right, (10mn – ) the path leads to the dolmen of the Briande Bay (a burial ground dating from 2000 BC).